Edit a configuration profile. If the configuration profile is already in use, run a configure job to apply the changes. Define the required configuration profiles to prevent configuration drift for DataStax Enterprise clusters. A configuration profile enforces uniform configuration at the cluster, datacenter, or node level. The items below are common known issues that you might encounter when configuring DataStax Enterprise clusters in Lifecycle Manager (LCM). Wherever possible, workarounds are included. Add a configuration profile that defines the configuration for DataStax Enterprise clusters. The config profile informs Lifecycle Manager which supported version of DataStax Enterprise to install, configure, and manage. Configure Lifecycle Manager for DSE Graph workloads. DSE Tiered Storage segregates hot and cold data. Configure the storage tier strategy and paths to each tier in an LCM config profile. Configure an http or https proxy for expediting package downloads by way of caching, or for an environment where DataStax Enterprise clusters must be isolated offline from the internet. Delete a configuration profile. Delete a config profile if it is obsolete or if you prefer a node or datacenter to inherit a config profile from its cluster. Automatically manage Java installs and upgrades within configuration profiles. Managing Java installs is enabled by default in Lifecycle Manager, which downloads the JRE package and accepts the license on your behalf. The JRE or JDK is required for most DataStax products; including DataStax Enterprise (DSE), Lifecycle Manager (LCM), and OpsCenter. You can also point to your own internal download location for packages. If there is no Java version found on a target during an install job or configuration job, LCM installs the specified version of Java. If a Java version is found but it does not match the specified version, LCM installs the specified version of Java specified alongside any outdated or incorrect version already installed. If managing Java is disabled, and no version of Java is found on the target, the install job fails. In the above example, the 1.8.0 is the major version, 60 is the update version, and 27 is the build. If your organization requires a version other than the default provided, enter the version information in the java-setup page accessed in the Lifecycle Manager section of the Config Profile pane. For more details about Java version naming conventions, see the Oracle documentation. If LCM is managing your Java installations, it can also manage installations of the Java Cryptography Extension (JCE) Unlimited Strength Policy files. JCE files enable the use of strong encryption suites. Note: Ensure that usage of the JCE files is legal in your jurisdiction. JCE-based products are restricted for export to certain countries by the U.S. Export Administration Regulations. Click Config Profiles from the Lifecycle Manager navigation menu. Click the edit icon for the config profile you want to edit, or click Add config profile if you have not already created a profile. 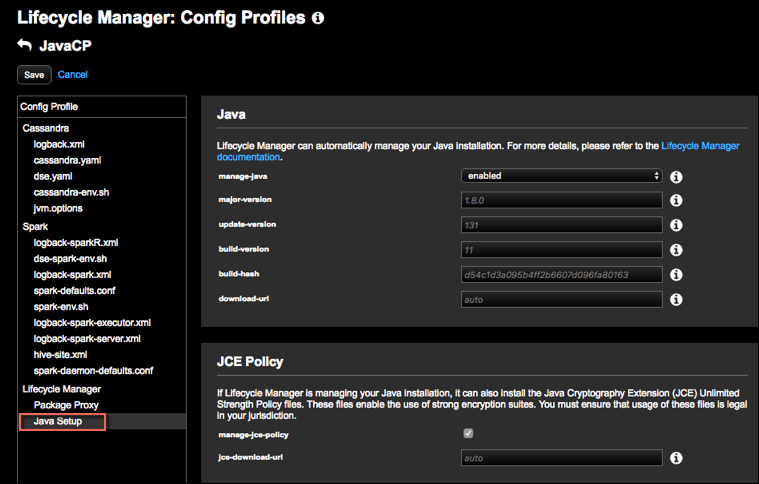 In the Config Profile pane under the Lifecycle Manager section, click Java Setup. The settings including defaults for managing Java install versions appears. Click the information (i) icon to view information inline for each available field. Optional: To disable automatically managing Java installs, clear the manage-java setting. You might want to disable Java management if you have pre-installed your desired version of Java and do not want LCM to alter your Java deployment. Provisioning skips installing Java when manage-java is disabled. If managing Java is disabled, and Java is not found to be already installed when running an install job, the install job fails. When manage-java is enabled, target nodes download Java directly from Oracle servers. To download the Oracle tarball from a local mirror, enter the complete URL to the tarball. In any case, complete the major-version, update-version, build-version, and build-hash (if applicable) fields so that target nodes can verify that the expected version of Java is available. Optional: Enter the version of Java to install in the major-version box. For example, 1.8.0. To override the default, enter the applicable major version number. Optional: To override the default, enter the specific update number of a version in the update-version box. Each Java release is identified by an update-version within its filename. For example, the update-version for server-jre-8u121-linux-x64.tar.gz is 121 as indicated by 8u121 (version 8 update 121). Optional: To override the default, enter a value for final released build version in the build-version box. Each Java release is additionally identified by a build number in its download url. For example, in the download-page at https://www.oracle.com/technetwork/java/javase/downloads/server-jre8-downloads-2133154.html, the url for server-jre-8u121-linux-x64.tar.gz includes .../java/jdk/8u121-b13/..., in which the build number is 13 as indicated by b13 (build 13). Optional: To override the default, enter a value (or leave blank as appropriate for older Java releases prior to 8u121-b13) for the build hash-version in the hash-version box. Java releases from 8u121-b13 onward are additionally identified by a build hash-version in their download url. When downloading older Java releases, the build hash-version can be left blank. Optional: To download Java from a custom location rather than directly from Oracle, enter the location in the download-url box. Important: The *-version fields are still required to construct the particular download version from a custom location. Optional: To disable downloading JCE, clear the manage-jce-policy setting. Optional: If your organization has its own mirror, enter the location in the jce-download-url box. If left blank and managing JCE policy is enabled, the JCE is downloaded directly from Oracle. Note: Kerberos, client-to-node encryption, and node-to-node encryption require JCE installed on every node. Configure a package proxy to cache and expedite package downloads. Run a configure job to apply the config profile changes.